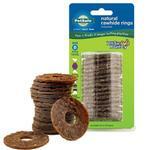 Treat your dog to toys with a great taste with the Busy Buddy Gnawhide - All-Natural Rawhide Ring Refills! Refills for your dogs favorite toy. Busy Buddy treat rings are designed for use with select Busy Buddy toys, including the Bouncy Bone™, Bristle Bone®, Nobbly Nubbly™, and Jack. Make playtime last longer by adding these treat refill rings to your dog's Busy Buddy toy. Posted On 05/01/18 by Pam S from , FL Yes, Pam S recommends this product! 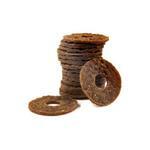 I love these gnawhide rings and always make sure I have a supply on hand. I use them with the "Busy Buddy Bristle Bone Dental Toy", which my dogs love. I save them as a treat when we have major weather problems, 4th of July fireworks, outside distractions like lawn service and anything that cause my dog distress. Once he gets into chewing on this toy, it distracts him from the noise and people outside and the world is a better place for both of us! Posted On 05/15/16 by Jada L from , AZ Yes, Jada L recommends this product! My dog is a big chewer and she LOVES these. They are do easy to put on the ends of the chew toy and lasts her longer than any other chew toy which she enjoys! Posted On 02/06/16 by Laura S from Lubbock, TX Yes, Laura S recommends this product! My little Shichon loves chewing these off his busy buddy toy. He can chew them off in minutes! Only wish there were more in the package! Posted On 06/03/15 by Suzanne I from olathe, KS Yes, Suzanne I recommends this product! My pups love these rawhide rings on the chew toys. Helps with teething and keeps them occupied. Posted On 06/03/15 by Monica G from North Jersey, NJ Yes, Monica G recommends this product! Posted On 05/30/15 by Kristy B from , Yes, Kristy B recommends this product! This is a refill for several different busy buddy toys. My dog loves these! They are the texture of rawhide, so they last a really long time. Since they are put on the ends of the busy buddy bones and the dog can't get straight to them, they last even longer than you'd think. Plus, they provide a fun game for your dog! I chose this item because I wanted something easy for me and my dog. I have a dog carrier that attaches to the back tire, its lots of room for the dog but its not as easy to carry in the car as this tote will be.